It remains hot and dry across most of Colorado as firefighters continue to battle several large wildfires that have forced people out of their homes. DENVER – It remains hot and dry across most of Colorado as firefighters continue to battle several large wildfires that have forced people out of their homes. The latest fire to erupt in the state is the Lake Christine Fire burning near Basalt. The Eagle County blaze sprung up Tuesday and has forced several people out of their homes. 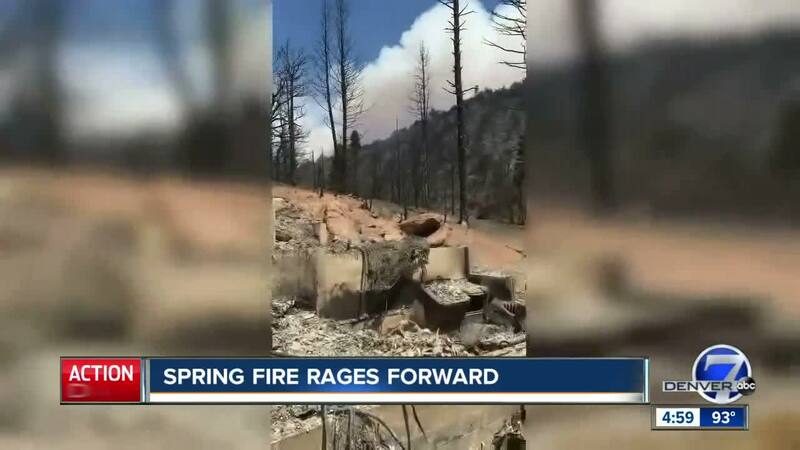 The largest fire in the state, the Spring Fire in Costilla County, is now among the largest fires in Colorado history and it keeps on growing. The fire was estimated at nearly 79,000 acres as of Tuesday morning. The largest fire in Colorado history, 2002's Hayman Fire, burned more than 138,000 acres. Fire officials had said Monday that the blaze was 10 percent contained but that number later dropped to 5 percent. San Luis Valley Emergency tweeted Monday night that 104 homes have been destroyed so far by the wildfire east of Fort Garland. The blaze has burned 89 square miles and forced the evacuation of more than 2,000 homes since last Wednesday. Highway 160 remains closed due to fire activity. There is no estimate of reopening at this time. Highway 12 is also closed in the Cuchara Valley area due to mandatory evacuations. For a current list of evacuations in Huerfano County please visit the Huerfano County Facebook page at www.Facebook.com/HuerfanoCountyOEM . For evacuations in Costilla County visit the San Luis Valley Emergency page at slvemergency.org for a current evacuation map. A Danish man was arrested on suspicion of arson charges and placed on an immigration hold last week in connection to the fire. Anyone with further questions about the Spring Fire can call a hotline set up at 719-480-8719. The Lake Christine Fire burning near Basalt has prompted officials to order an evacuation of several homes on Original Road, Silverado Dr, Hillcrest Drive and the Pineridge area. The following areas are under a pre-evacuation notice: Big and Little Pinyon areas, Sagewood area and the area around the Church of Christ. The fire was first reported Tuesday and is burning west of the Basalt gun range in Eagle County. The Eagle County Sheriff's Office tweeted that there were multiple crews on scene with air support.